The Boston Marathon – The world’s oldest annual marathon, this is New England’s most widely viewed sporting event (yep, even surpassing Red Sox games). If you’re not a runner, this might not seem like an exciting event, but you only have to take a short trip to where the race runs along Beacon Street or Commonwealth Avenue to find a spectacle worthy of attendance. Enjoy the energetic atmosphere, the many specials restaurants and bars along the course run, and the hilarious costumes many runners wear for the race. Independent Film Festival Boston – A multi-day event with films showing in several theatres around Boston, this is great entertainment mixed with parties, panels, and educational events. Must-attend for movie lovers, and a good time for everyone else. Mayfair – Every year in Harvard Square, the streets are shut down and filled with vendors selling everything from art to jewelry to bonsai trees. Five performance stages are setup for a variety of music and dance acts, all your favorite fair food is on sale, artists decorate the streets with chalk art, and performers wander the streets on stilts or surprise you with stillness as living statues. Harvard Square is a great place to explore anytime of year, but Mayfair makes it 10x so. 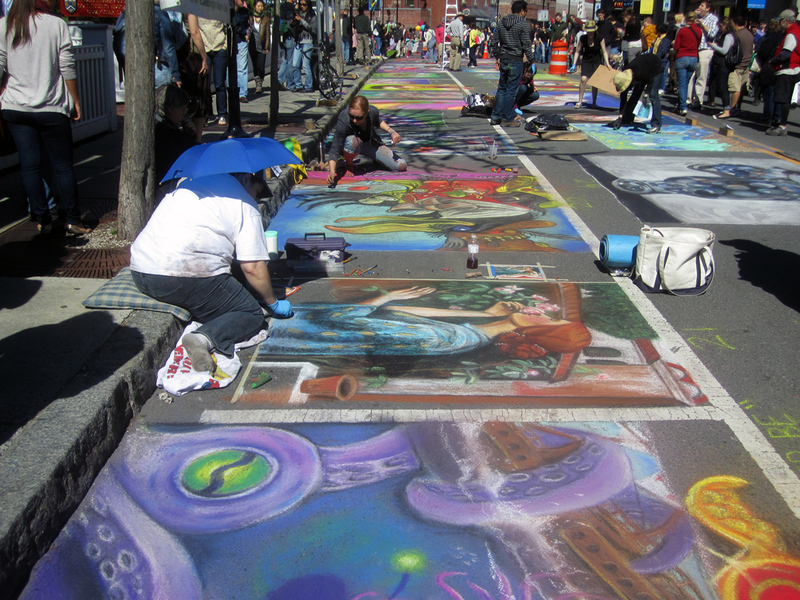 Somerville & Cambridge Open Studios – Organized by the local art councils in each city, artists in every neighborhood open up their studios for residents and visitors to see their work, how its made, and what a real artist’s working space is like. This is often an experience better than any gallery, and it’s free! Somerville Porchfest – A more recently started event, Somerville Porchfest is like open studios for music instead of art. Bands across town perform from their porches in shifts, so all day you can walk from neighborhood to neighborhood and find a band who’s sound you like. Honorable mention: SoWa Open Market opening day – The South-of-Washington Open Market is an every-Sunday crafts, vintage, and farmers market that runs from spring until the start of the winter. The first day is especially worth going to for the extra energy and full inventories of all the vendors. Previous Previous post: Back to Boston after Georgia.